Enhance your flower garden with a permanent bloom using the Ancient Graffiti Kinetic Dual Flower Spinner. This dynamic sculpture brings bold style to your yard, with its significant toppers, natural tones, and lasting construction. Two generous, 30" diameter toppers create a focal point on this piece, each with six large petals to evoke a flower in bloom. Each thin petal shape curves inward and has a cupped design, helping it capture a breeze for a lovely spinning effect. These significant toppers attach to the included, 72" tall shaft, and its twisted design continues the spinning theme. Its 15" wide, trident base ensures the piece remains stable in your soil, while the three, 7.5" long legs make it easy to install. A flamed copper colored finish throughout the unit enhances your backyard, and the slightly iridescent sections react in sunlight for added interest. Its durable, iron construction forms a lasting adornment, which will weather over time for more drama and style. 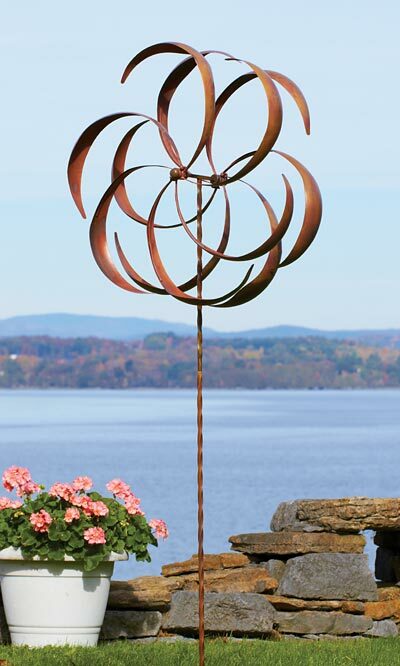 Enjoy a flower shape in your landscaping all year with this Kinetic Dual Flower Spinner. Assembly required.